A spectacular music lineup has been announced for ShipRocked 2019, celebrating a decade of rock ‘n’ roll on the high seas January 26-31, 2019 onboard Carnival Valorfor the first time. The greatest vacation ever will feature performances from Papa Roach, Bullet For My Valentine, I Prevail, Nothing More, Suicidal Tendencies,Sevendust, Motionless In White, and more, expanding to five days and nights, departing from Galveston, TX, with stops in Cozumel and the Yucatán in Mexico. Staterooms for ShipRocked 2019 are sold out, but a wait list is available atwww.ShipRocked.com. 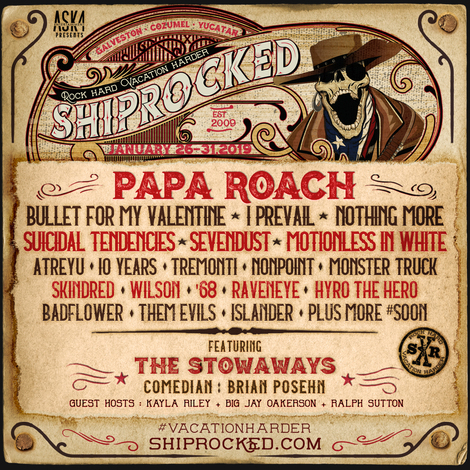 The current music, comedy and special guest lineup for ShipRocked 2019 is as follows: Papa Roach, Bullet For My Valentine, I Prevail, Nothing More, Suicidal Tendencies, Sevendust, Motionless In White, Atreyu, 10 Years, Tremonti,Nonpoint, Monster Truck, Skindred, Wilson,’68, RavenEye, Hyro The Hero,Badflower, Them Evils, Islander, as well as a very special appearance to be announced soon. 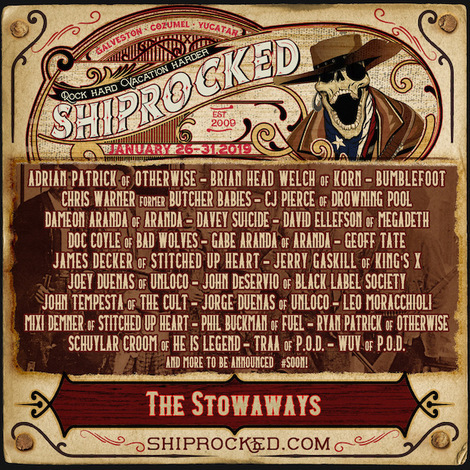 In addition, ShipRocked’s own featured all-star band The Stowaways will include:Adrian Patrick & Ryan Patrick (Otherwise), Brian “Head” Welch (Korn), Ron “Bumblefoot” Thal, Chris Warner (former Butcher Babies), CJ Pierce (Drowning Pool), Dameon Aranda & Gabe Aranda (Aranda), Davey Suicide, David Ellefson(Megadeth), Doc Coyle (Bad Wolves), Geoff Tate, James Decker & Mixi Demner(Stitched Up Heart), Jerry Gaskill (King’s X), Joey Duenas & Jorge Duenas(Unloco), John Deservio (Black Label Society), John Tempesta (The Cult),Norwegian YouTube sensation Leo Moracchioli, Phil Buckman (Fuel), Schuylar Croom (He Is Legend), Traa & Wuv (P.O.D. ), and more, plus various special guests from ShipRocked bands. ShipRocked guests will enjoy luxury accommodations onboard the Carnival Valorthroughout the vacation. Carnival Valor features multiple gourmet dining options, including Guy Fieri’s Guy’s Burger Joint, BlueIguana Cantina, Mongolian Wok, Ol’ Fashioned BBQ, and more. With 22 bars and lounges, well appointed sleeper accommodations, a tranquil spa, casino, fitness center, mini-golf, wet and wild waterslide, and multiple pools and hot-tubs, guests will have a frontier of options to choose from.